Jonathan Butler has reached the stage in his life where his greatest mission is to give back to others. The South African born gospel, R&B and jazz musician achieves that mission through his Jonathan Butler Foundation. The foundation offers music and therapy programs, specifically crafted by clinicians and educators for the organization, to thousands of South African children living in underprivileged areas. Those young people face many of the harsh economic realities that Butler faced years ago, even as the legally mandated racial caste system of apartheid has receded into history. Art and particularly music allowed Butler to escape that devastating economic and political condition, but it took the salvation offered by Christianity to heal Butler’s spirit, and he has dedicated his life and musical career to singing for Christ on projects such as his latest, the energetic praise and worship project, Free. 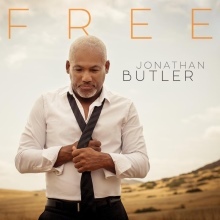 The songs of joyfulness, encouragement and perseverance that make up the track list of Free can be seen as Butler’s musical message to the young girls and boys involved in the Jonathan Butler Foundation, as well as listeners throughout the world. Butler brings his comfort with those percussive African rhythms, along with his jazz and R&B chops, to praise and worship numbers such as “Moving On,” while “He Is God” features a conversation between the tightly coordinated ensemble and Butler’s still strong and rangy baritone, along with jazzy improvisations by the musicians. Music has been Butler’s saving grace since childhood, when his talents opened doors that were closed to nearly all other black South Africans, so the title track’s lyrics certainly resonate. Still, Butler was scarred by the experience of living through apartheid, and he had to overcome his own demons. Salvation and gospel music helped to make Butler truly free, and the 11 tracks on the album Free provides an eloquent ministry for anyone embarking on a similar journey, and a joyful noise for those who like good gospel music. Recommended.